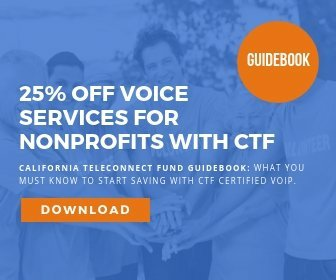 What is The California Teleconnect Fund (CTF)? CTF is a program run by the California Public Utilities Commission (CPUC) that provides a 25% off voice services and a 50% discount for broadband on select communication services for schools, libraries, hospitals, nonprofit organizations and about 7,000 Community Based Organizations (CBOs). Beginning August 3, 2018 all new Community Based Organizations (CBO) applicants will be evaluated based on the revised rules and criteria adopted in Decision (D)15.07.007 and D.18.01.006. “Community based organization” is defined as a small, nongovernmental, California nonprofit corporation which itself directly serves individuals and families and which offers services to anyone who needs it without charge or at a minimal fee. California Telehealth Network members shall be individually be qualified before receiving California Teleconnect Fund discounts. *”Qualifying services” include: health care, job training, job placement, 2-1-1 referral and information services, and educational instruction**, or a community technology program providing access to and training in the internet and other technologies. Powered by a team with over 40 years of experience together, UniVoIP is a pioneering leader offering CTF Certified VoIP and UCaaS (Unified Communications as a Service) solutions for organizations nationwide. UniVoIP offers comprehensive business communication platforms, multimedia contact center functionality, cloud-based collaborative and productivity tools, mobility applications, custom application integration with existing business systems and a world-renowned suite of advanced IP phones with mobile integration functionality. Exponential Savings – No initial investment and low monthly rates. Instantly save when you upgrade or move to a new location and happily avoid dropping a ton of money on purchasing new phones across the board. Oh, and no hidden fees too. Future Proof – Receive free upgrades for life and never get stuck with an outdated system. All updates are piped to your phones at no charge. Plus life-time warranties on each unit. Geographical Flexibility – Receive service wherever, whenever. Take that meeting in Kyoto, while picking up that call from NY, wherever there’s an internet connection, you’ll have phone service. Local Presence – Create outposts by setting a local phone number in any city and appear to have offices in that location. Expand business presence without having to rent an entire building. Credibility – Sound clear and professional when you pick up the phone and forget about call drops. Possess all the tools of an enterprise communications system at a fraction of the price. Scalability – Whether eight or eight hundred, scale as your organization grows. Need to open a new office? Not a problem; your system will be up in no time. Easy Setup / Easy to Use – Getting started is as simple as plugging in a phone, and with UniVoIP’s administrative portal customizing settings is a cinch. Mobility – In your car, or on the go, always have access to your phone system and never miss a call again. Whether it’s receiving a voice-mail via email, or having your desk phone twinned with your cell you will always be kept in the loop. 24/7 Support – It’s three in the morning and you need help. Don’t worry, just give our team a call and we’ll get right on it. UniVoIP Support is friendly, knowledgeable and gets the job done. To inquire about CTF Certified Hosted VoIP contact marketing@univoip.com or call 855-UNIVOIP.